Welcome to Secrets of Automobilista where I will be recording my experience, tips, tricks, resources and other helpful information as I get into Automobilista. Update 2017-10-15: Added Getting Started > Essential Content > Mike’s Essentials (SimRacing604). AUTOMOBILISTA puts you in the driving seat of an advanced racing simulator to deliver a uniquely diverse motorsports experience! In Secrets of X, I try to focus on the non-obvious or unintuitive so I won’t be covering basics like getting the game, installing it, tweaking graphics or force feedback. You’re probably beyond that yourself so I’ll focus on the hidden and obscure things. Update 2018-09-28: Published a new post, Secrets of the SimXperience AccuForce Pro, in my Secrets series where I’ll be recording the less obvious/less intuitive discoveries and tips and tricks with the AccuForce and SimCommander. I’ll be putting AccuForce Game-specific content over there from now on. Update 2018-02-24 – 2: Added Tips and Tricks > AccuForce causing spurious inputs / Inability to assign controls in-game due to spurious inputs section detailing a fix if your AccuForce is causing spurious inputs. Update 2018-02-24: Organized with a Table of Contents. 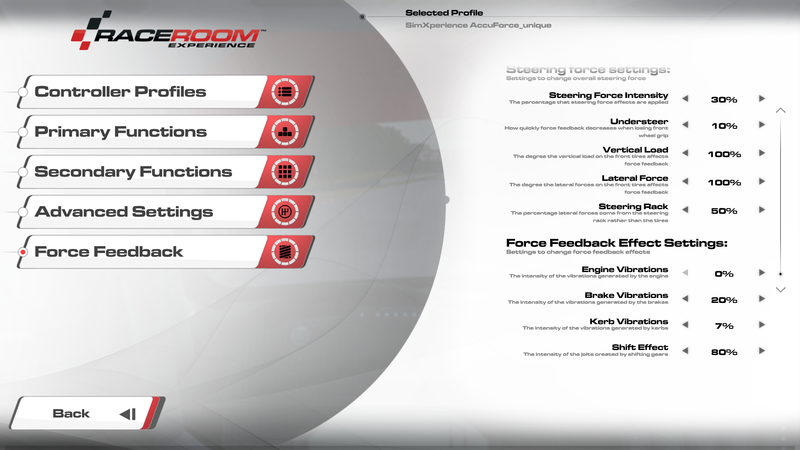 Update 2016-11-15: My latest R3E settings, including the November 2016 update, are over at my RaceRoom Racing Experience Force Feedback Settings post. 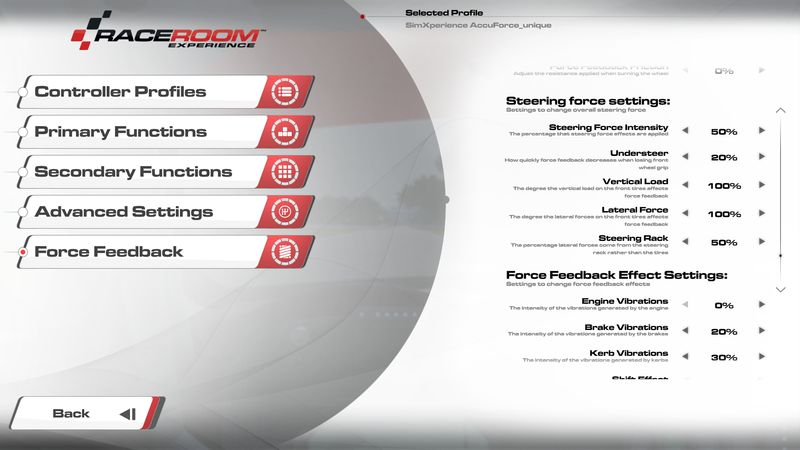 Update 2016-06-10: Updated Assetto Corsa FFB settings a little. Update 2016-03-31: After the R3E update, I was getting a constant vibration in the wheel that tracked the cars speed (not engine rpm). People said to zero Slip Effect in-game but that wasn’t working for me. I eventually created a brand new R3E controller profile in-game and then compared to my previous profile. I noticed some differences like “FFB steer vibe freq mult=0” (and related values). Once I synchronized those I changed Slip Effect to zero in-game and that solved it. Update 2016-03-08: Clarified certain language after time and reflection per the Closing Thoughts section. Filled in some sections that were still left undone. Update 2016-02-19: Updated R3E section to sync with update notes. 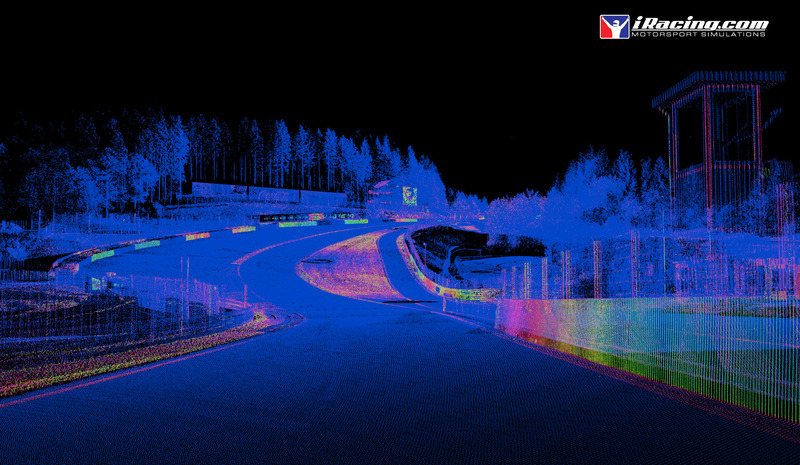 Added Assetto Corsa and rFactor place-holder sections for now. I plan to add more as I setup those games to work nicely with the AccuForce. Update 2016-01-12: Added Suggestions for Improvements section. Update 2016-01-01 – 3: Continuing my RaceRoom Racing Experimence experimentation (see updates below) I have been trying different cars with the settings I came up with earlier. I’ve run the Cadillac CTS V.R, BMW M4 DTM 2014, and the Aquila CR1, all at Brands Hatch Indy. They all felt really great except the Aquila which had very heavy steering (I’m not sure if S3 has updated the car in a long time) and its shift effect is ridiculous, I’ll have to turn that down even though it’ll also effect the other cars. I’ll be trying more cars and more tracks as my next step… Tested the McLaren MP4-12C, Ford Mustang GT3, Audi V8 DTM 1992, and 134 Judd V8. They all feel way better than my previous settings. The only quibble I have is cars with heavy steering could feel better. Remember some cars do not have updated physics/ffb (like the BMW E30 Gr. A I just tried) and they feel particularly “numb” or “dull”. Update 2015-12-24: Added a Closing Thoughts section which wraps up my thoughts and feelings after having driven with the AccuForce now for more than 6 months. What do I really think of the AccuForce? Would I buy it again? 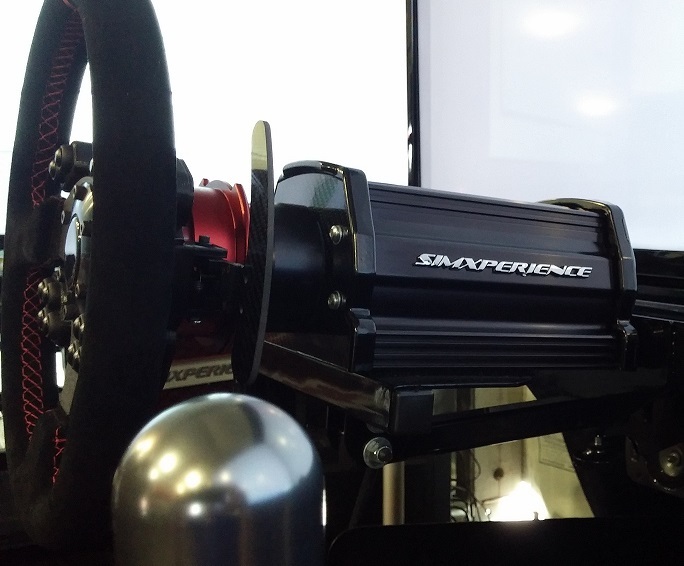 Read on to find out… Oh, and here’s an article over at MockRacer.com about the Leo Bodnar SimSteering2 wheel where he compares it the AccuForce he tried earlier in the year. The direct drive wheel market keeps getting more and more interesting. Update 2015-11-26: I picked up Stock Car Extreme on the Steam Fall Sale ongoing right now. Not a bad pikcup for CAD $20. Sim Commander supports it right out of the box with pretty good settings. I made a new SC profile from scratch and reset it to defaults. When you launch SCE for the first time remember to set Windowed mode or you won’t see Sim Commander’s overlay in the game. In game, you’ll need to setup your controls as per usual for any sim. It doesn’t feel like SCE knows about the AccuForce so I had to set the Wheel Range (in the Controls screen just after you launch a track but before you get on) to 900. It still feels off, you might need to set the Wheel Lock in the Garage screens to 30 to get a 15:1 steering ratio (ie. something like GT-style steering ratio). 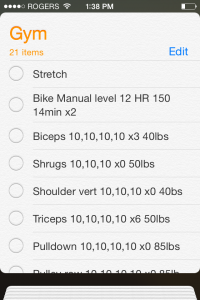 Let me know if there are any more settings we AF owners should be setting for a more solid ride. Enjoy. 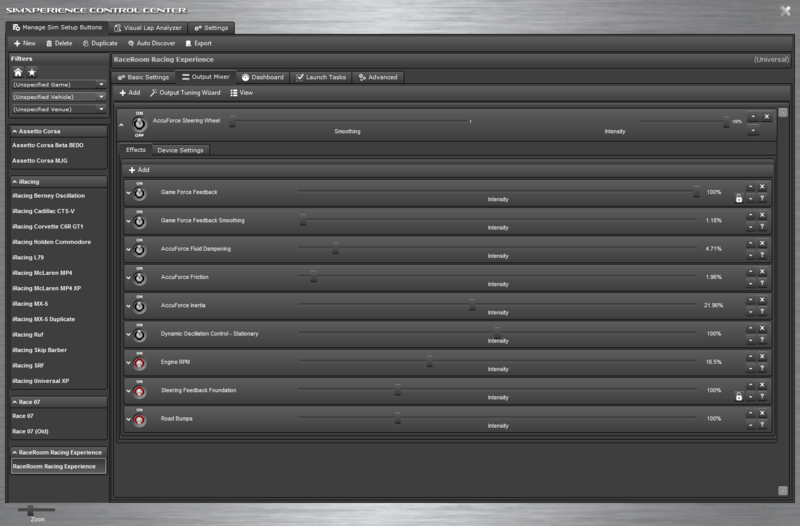 Update 2015-09-25 – 6: A note on dialing in range settings. I’ve mentioned it before but I think I’ll mention it again. When I come up with settings within a range (ex. Smoothing 5% where the range is 0% to 100%) I do a binary search by hand. Put simply, a binary search is starting at one extreme, adding or subtracting half the range, and then adding or subtracting half again, based on preference, and repeating this process until you find an optimal value. For example, with Damping I went from 0% to 100% to try the extremes, then 50% because it was too high, then 25%, then 12%, then 6%, all based on preference. So, put in the setting, run a lap and, if it feels too much lower the value or if it doesn’t feel enough raise the value. Update 2015-09-25 – 5: I’ve been playing around with Smoothing (5%), Damper (6%) and Friction (6%). Smoothing was at 25% before and it was taking a little bit of definition out of the ffb so I put in just 5%. Damper was at 0% before and it tends to simply dampen all forces (sort of make them slower) and I found more dampening helped me catch sliding backends. Friction was at 0% before and it applies a resistance to the strength you put into turning the wheel. I found in slides or losing grip that something felt off, it was too easy to swing the wheel back and that caused me to misjudge how I correct a slide. Turning up friction to 6% (after trying a binary search) helped me just a little better about how to correct my steering in those scenarios. Update 2015-09-25 – 4: Even though R3E doesn’t officially support the wheel yet I find I’m finally getting to like the AccuForce FFB results after a lot tweaking (see the updates below from the last few days). The only thing really bugging me right now is the boat-like swaying motion on straights (“floaty” steering feel near center) and also the awkward steering feel when your backend flies out and you need to counter-steer. Something’s still not right there. But, hey, things are feeling pretty enjoyable. Update 2015-09-25 – 3: I experimented in R3E with Steering Rack FFB. I was used to 0% (ie. all forces from tires as opposed to steering rack) so I flipped it 100% (ie. all forces from steering rack as opposed to tires) and I noticed a more “gradual” or “analog” rise and fall as I mounted and dismounted kerbs. I quite like the extra information so I’ve currently settled on Steering Rack 50% (ie. half of all forces from tires and half of all forces from steering rack). Update 2015-09-25: Tweaked R3E Steering Force Intensity and Understeer as I put in more seat time and learn what I like. 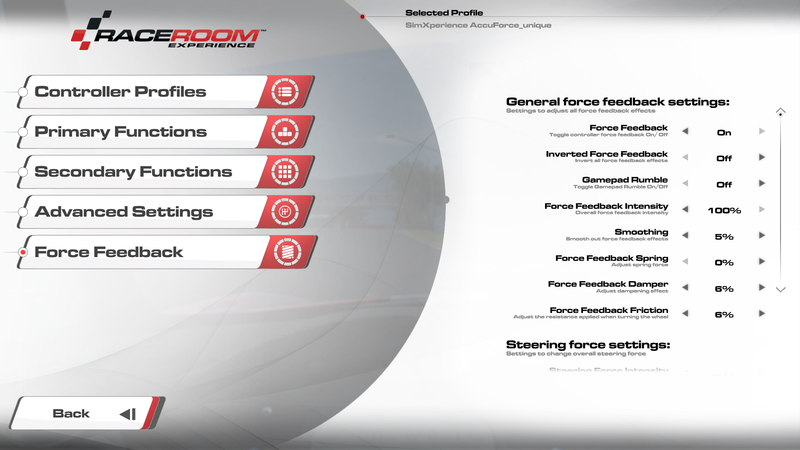 Update 2015-09-17: Added force feedback settings for RaceRoom Racing Experience. 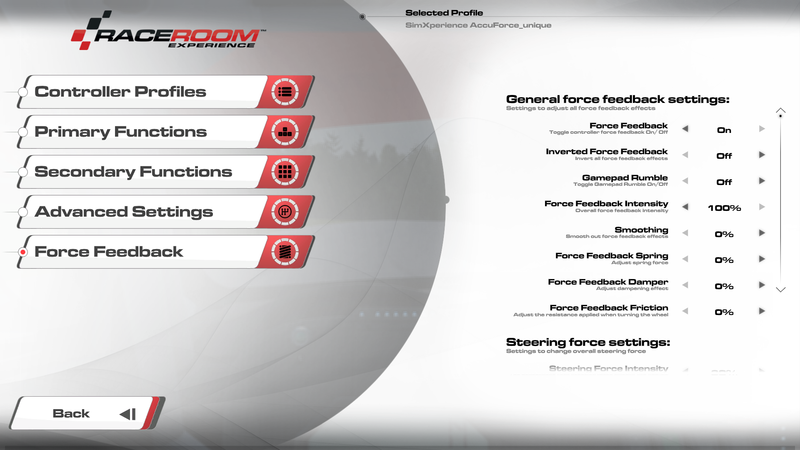 Basically I reset the Sim Commander Profile and then set Steering Force Intensity 70% 50% and Understeer 25% 20%. 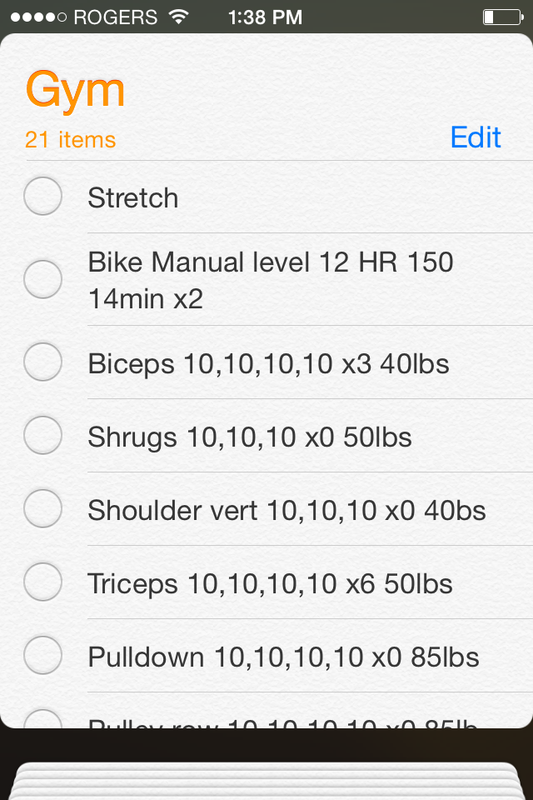 That’s all I’ve done so far. 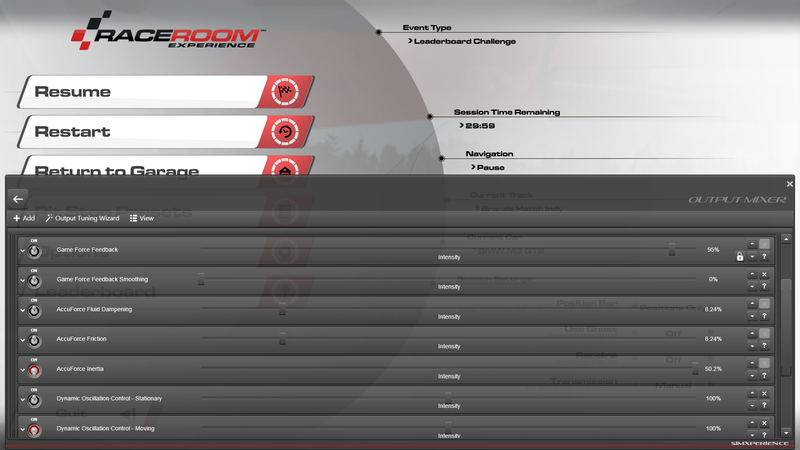 Update 2015-09-15: Having problems with Sim Commander crashing after launching games or the in-game overlay not showing in some games like RaceRoom Racing Experience? Power cycle your AccuForce and it should come back. I knew this trick since I ran into a bug when I first got the wheel where the computer wouldn’t even boot with the AccuForce on. Since then I must have gotten into the habit of turning the AccuForce on shortly after booting and that was causing problems. 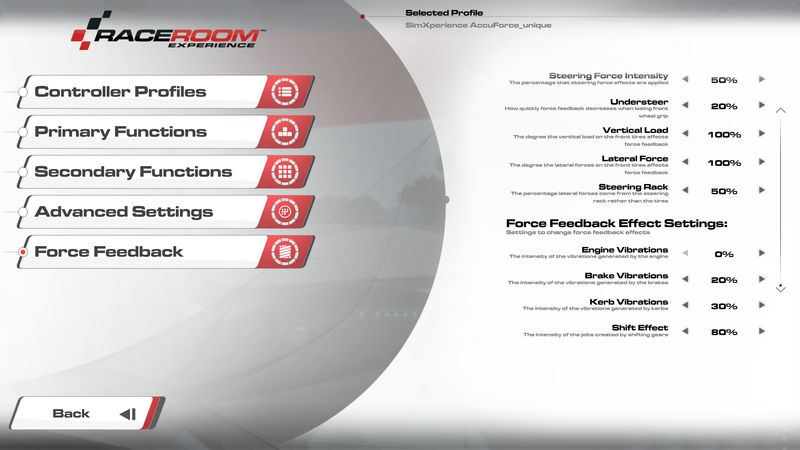 If I only power on the AccuForce after logging in then RaceRoom appears to work flawlessly and I don’t need to power cycle. Update 2015-07-30: Check this very helpful and informative post on tuning the Accuforce Pro: AccuForce Settings For Dummies. Update 2015-06-03: Added RaceRoom Racing Experience after 2015-06-02 Update section. 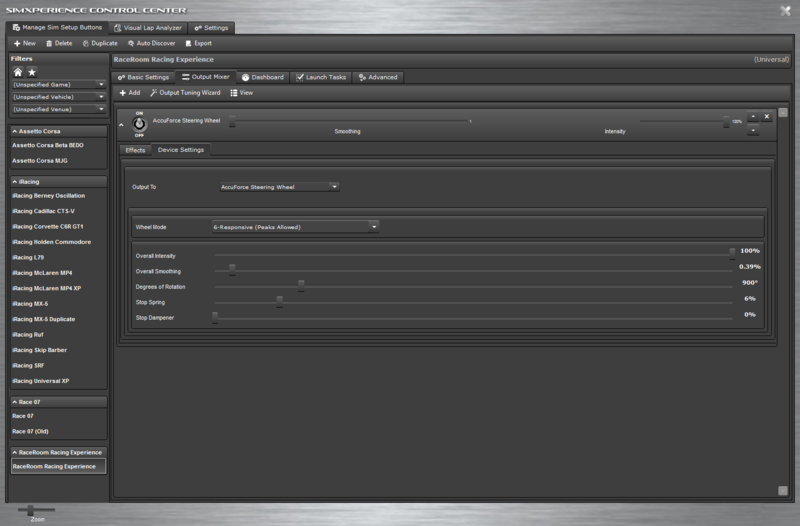 Update 2015-06-01: Added Auto-Tuning with Sim Commander Software section. Recommended read for AccuForce owners: AccuForce Tuning Feedback Test. 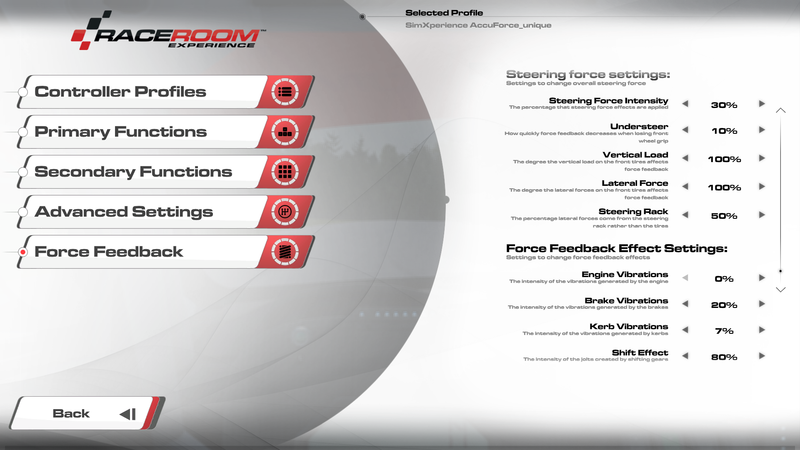 This is a thread Berney of SimXperience created after the Sim Racing Garage head-to-head video, mentioned below, attempting to provide collect some user experiences and determine what kind of changes could be made to the wheel to improve feel for sim racers (who may have different force feedback tastes than real-life race drivers). Update 2015-06-01: Barry, from Sim Racing Garage, has release a head-to-head comparison of the Accuforce Pro, Bodnar, and OSW wheels. It has highlighted some nagging concerns I’ve had ever since I’ve been playing with the wheel. Before we go any further, don’t think for a moment I’m saying the Accuforce is not a good wheel. It’s a professional, supported, warrantied, complete package, direct-drive, very strong wheel, with good force feedback and excellent tuning options. It’s a great wheel and at a competitive price. What I will say though is that the forces are not coming through as much as I’d like. For example, one reviewer in the video mentioned how it was difficult to tell the different between a slide through grass and the moment it hit the pavement during the slide. The AF wasn’t communicating that well. Other examples include strong cornering forces washing out road feel, or banking or kerb forces not feeling as defined as the other wheels. On the SimXperience forums, Berney (of SimX), has said he’ll be thinking about pushing out wheel updates to work on the comments the reviewers had in the videos. I look forward to trying those updates. I’ve recently received my SimXperience AccuForce Pro and have been enjoying it for the past week. I’ve only owned one other force feedback wheel, a Logitech G27, and this is, of course, leaps and bounds beyond a G27. There is ample power and tuning options to provide the flexibility sim racers really want to ensure the best and most realistic experience while driving. I’ll be posting my initial thoughts, my driving and tuning experiences, and providing tips and tricks for various facets of the wheel, it’s tuning software, and for the various sim titles I play. I’ll be writing this post in parts and updating new sections as I have time and learn new things about the wheel!